This fall you'll see military inspired neutrals (especially olive). 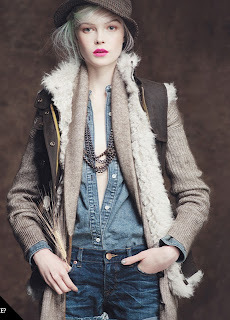 The JCrew's fall lookbook is full of sassy girl scout inspired pieces with lots of texture, leather, fur, and hats. We love that the JCrew stylists used Nars' Funny Face lipcolor as a "punctuation mark" for an otherwise monochrome palette.